Fig. 1. Flooded crop field in southwestern MN, July 3, 2018. Flooding, ponding, and saturated soils continue to impact crops across southwestern and south central Minnesota. 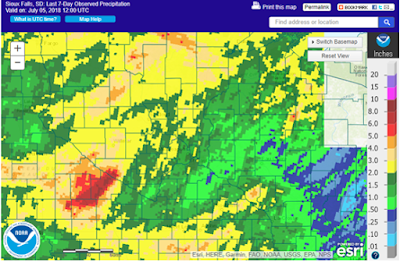 Intense rains, ranging from 6 to 8 inches or more in several counties in southwestern MN on July 3, has exacerbated the wet conditions. As water from the recent storm events moves downstream, more field flooding and ponding is anticipated. As of July 5, 2018, much of southwestern and south central MN accumulated 4 to 8 inches of rain above normal, or a 3 to more than 4-fold increase above normal precipitation for the previous 30 days. Fig. 2. Precipitation over the last 7 days as of July 5, 2018.
as of July 5, 2018. Crop development stage is quite variable this season due to a wide range of planting dates. Plants that are partially submerged have a better chance of survival than plants that are completely submerged, although root development and nutrient uptake will still be impacted. When corn is at the V5 stage (5 leaf collars) or less, its growing point is below ground, causing it to be more susceptible to flooding. Corn at this stage can generally survive two to four days of flooding, although plants may not survive more than 24 hours when temperatures are above 77°F. Corn at the V7 to V10 stage can generally tolerate standing water for 7 to 10 days, depending on the temperature, due to a deeper root system that can recover more quickly from saturated/low oxygen soil conditions. Temperatures above 86°F, however, decrease the ability of the plant to tolerate standing water. During pollination, corn is more susceptible to flooding, as this is one of the most critical stages for corn development in determining yield potential. In general, significant yield losses can be anticipated after 2 to 4 days of standing water at this growth stage. Potential corn yield impacts: Corn takes up about 5% of its season-total nitrogen (N) requirement by V6 and two-thirds by pollination. Inhibited root growth hinders nutrient uptake. If this occurs during the two week period before pollination, yield can be significantly impacted. 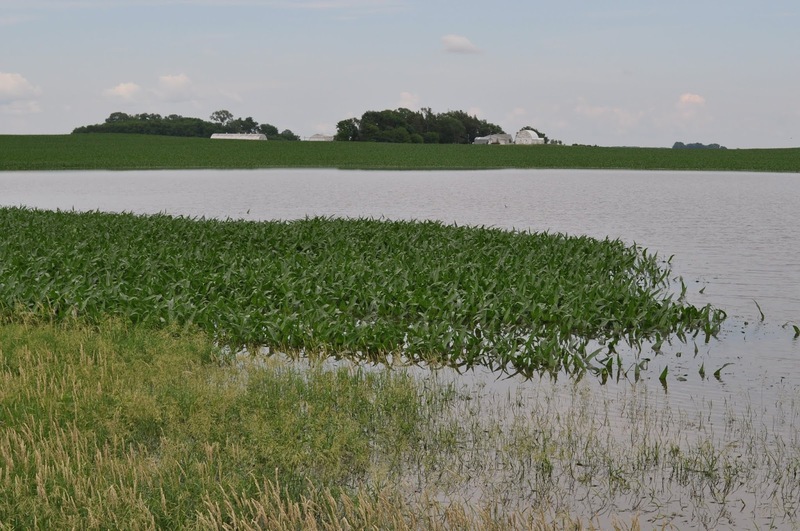 Research at Iowa State University evaluated the effects of flooding on corn. When 30-inch corn (approximately V6 stage) was flooded for 48 hours, yield was reduced by about 5% in the absence of N stress and by 20% in low-N growing conditions. 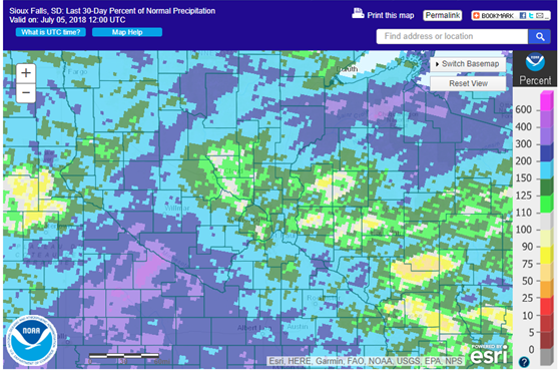 When corn was flooded for 96 hours, yield losses were 5% in the high N environment but 30% in a low N environment. When corn was flooded for 96 hours during pollination, yield was not reduced in the absence of N stress, but was reduced by about 15% in the low N environment. Supplemental and late-season nitrogen application: Excessive moisture and prolonged saturated conditions can lead to N losses in fields (refer to Continued Rainfall and Excessively Wet Field Conditions for a more-in depth discussion). The U of MN Supplemental Nitrogen Worksheet for Corn can help determine whether supplemental N is needed. Be aware that rescue nitrogen applications may be more advantageous in longer-season regions than those of Minnesota. Before applying additional nitrogen take a hard look at the cost-benefit of the application based on your situation. The yield potential of the crop and the ability to increase yield with nitrogen is likely compromised at this stage in the growing season. Also, consider other factors that may impact nitrogen availability such as greater potential for weed pressure in fields where corn does not have a full canopy. Soybean can generally survive being under water for 48 hours. Four days or more of flooding stresses the crop, delays plant growth, and causes the plants be shorter with fewer nodes. Flooding for 6 days or more can depress yields significantly, while flooding for a week or more may result in significant (or entire) losses of stand. Potential soybean yield impacts: At the V4 stage, researchers reported yield losses of 1.8 bu/ac per day of flooding in a clay soil and 0.8 bu/ac per day on a silt loam soil (Scott et al., 1989). At the R1 stage, yield losses were 2.3 and 1.5 bu/ac per day on a clay and silt loam soil, respectively. Note that wide ranges in yield losses can be observed, even under similar circumstances and environmental conditions. Subtleties regarding soil texture and soil borne diseases likely play a determining role in the plant’s response to flooding. In addition, as with corn, N plays a very important role in affecting soybean’s response to flooding. This may be partially responsible for the wide variation seen in the response. Bacanamwo and Purcell (1999) noted that N accumulation in soybean is much more sensitive to flooding than is biomass accrual. Because N2 fixation in soybean is especially sensitive to hypoxia, soybean plants cannot support their high N demand. Yields will be limited due to availability of N for seed protein. In this research, yield impacts of flooding were reduced by supplementing soybean plants with N fertilizer. Low soil organic matter fields that are exposed to very dry conditions in August and September are likely to be most affected by midseason flooding. However, depending on organic matter and weather conditions in the second half of the growing season, there may be abundant mineralized N to support soybean growth and development. Soybean quality research at the University of Minnesota supports the importance of N for soybean production under excess water conditions. Data gleaned from farm-collected samples in the US Soybean Quality Survey, regularly identifies low protein regions in the US where early- to mid-season rainfall is in excess and late season rainfall is insufficient. Although yield impacts cannot be determined, reduced protein levels are a good indication that yields were limited in these locations. One might be tempted to supplement flooded soybeans with N; however, researchers have not yet found this to be an economical practice. Moreover, with predicted depressed yields and prices, supplemental N is very unlikely to lead to a positive economic or environmental outcome. In corn, stalk rot and lodging can be commonly found later in the season in areas that were flooded. This should be taken into consideration at harvest time when determining which fields to combine first. In soybean, pythium and phytophthora are favored by wet conditions, although pythium typically does not kill plants much past the V5 growth stage. After the flood waters recede, mud or piles of crop residue on plant can reduce photosynthesis, further stressing surviving plants. Ideally, drowned-out spots should be planted to non-crop covers in order to suppress weeds and other crop-pests while reducing the effects of fallow soil syndrome. The choice of cover crop species is critical. Matching an appropriate cover with herbicides already applied is of primary importance. See Managing risk when using herbicides and cover crops in corn and soybean for more information. Further information on potential cover crop options can be found at: https://z.umn.edu/ccoptions. A low-cost option for drowned-out spots is soybean. However, soybeans planted after July 1 will produce less than 50% of an early-planted crop. Since yields are declining at about 0.5 bushel per acre per day, planting beyond mid-July may not produce a harvestable crop. See Delayed planting for more information. Planting soybean into drowned-out corn is not preferred. Even when previously-applied herbicides will allow it, this will lead to a soybean-on-soybean situation (except in continuous corn, of course). Even very small areas of soybean-on-soybean can lead to reservoirs of soybean pests and diseases including, weeds, SCN, and soil borne fungal pathogens that will affect subsequent soybean crops for years to come. Abendroth, L.J., R.W. Elmore, M.J. Boyer, and S.K. Marlay. 2011. Corn growth and development. PRM 1009. Iowa State Univ. Ext., Ames.